Mahanand dairy is always related to many breakthroughs in the Milk Production and Dairy Technology in India. In keeping with its reputation, Mahanand dairy decided to opt for solar energy to satisfy its thermal energy needs in its pasteurization process. After a techno-economic analysis, Mahanand decided to give the ARUN technology, Concentrated Solar Thermal technology (CST), a try. The ARUN solar boiler technology was innovative & indigenously developed by Mumbai based Clique Solar, India’s first solar boiler company and a company run by an IIT alumni. It’s completely automatic two-axis tracking system ensures maximum efficiency. The installation was complete by Feb 2006. 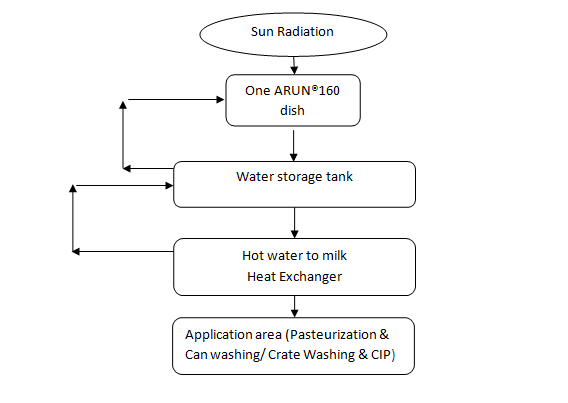 A single ARUN® dish (CST system) delivers energy sufficient for pasteurization of ~30,000 liters of milk & CIP of milk storage tanks on a clear sunny day at Latur. It continues to save about 20,000 liters of Furnace oil per annum for Mahanandsince. A single ARUN solar boiler is operational for hot water generation for milk pasteurization. The system pressure and temperature is 18 bar and 180°C respectively. Due to a mismatch in the working hours of the plant and availability of sun, an insulated pressurized water storage tank has been provided for storage of thermal energy. Pressurized water was selected as the medium of heat transfer and storage as it has high specific heat, no fire hazards, no possibility of accelerated oxidization overnight (as in case of tarring of thermic oil), compatibility with food products and low operational cost. ARUN® solar boiler demonstrates excellent technological innovation for dairy industry as the heat is generated by solar & delivered with critical controlled temperature within ±0.5°C at any time during the day or night. The 4.5m³ pressurized hot water storage tank stores the hot water and supplies the same whenever required to milk heat exchanger. The hot water supplied to heat exchanger returns back to the storage tank at a lower temperature and it gets heated again by solar energy. The solar water heater produces hot water that can also be used for CIP, can washing etc. Mahanand Dairy is an excellent example of successfully installing the ARUN solar concentrator system for satisfying its thermal energy needs in milk pasteurization, CIP & other dairy applications. Not only has the system been operating successfully for over 6 years now, but the economics are very attractive. The MNRE subsidy coupled with accelerated depreciation makes this an extremely attractive alternative to the rising fuel costs and environmental concerns. Chitale Dairy has always focused on providing customers with better value for money by continuously improving the technologies used in their dairy processing process. Its solar installations at its dairy located at Bhilawadi in Sangli is a fine example of how this corporate philosophy guides its actions. On average, water heating accounts for more than 30% of the energy consumed at dairies in India. By installing two ARUN-160 solar boilers, concentrated solar thermal systems (CST) dishes on the terrace of its existing dairy at Bhilawadi, Chitale now saves an equivalent of almost 40,000-42,000 litres of fossil fuel (furnace oil) per annum, which equates to a reduction in CO2 emissions by almost 110-130 tons per annum! This is also equivalent to a saving of almost 15-20 paise per litre of milk. 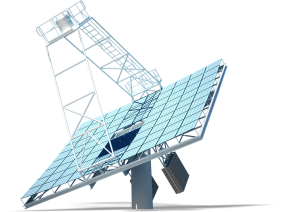 The ARUN dish is a completely indigenous Solar Concentrator System developed by Clique Solar – the innovative dish design and the automatic two-axis tracking system ensures the highest thermal energy output per sq.m. 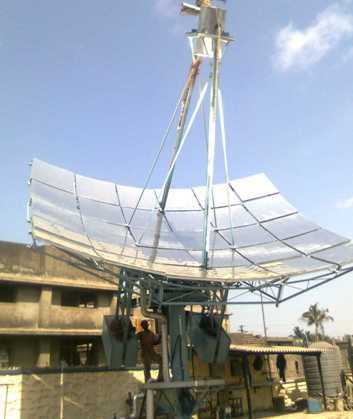 of collector area compared to any other solar concentrating system in India with minimum losses. There were issues from economic feasibility to space constraints. There were even basic questions like the best application of such a solar thermal system in a dairy keeping in mind the cost versus the benefits and the integration requirement; and how to ensure that the system performs as promised, when many solar installations are either dysfunctional or operating at very low efficiencies. After studying the requirements and constraints of its dairy and understanding how these factors can be technologically and economically overcome by harnessing solar thermal energy, Chitale concluded that the use of solar thermal concentrating systems for their thermal requirements was the most suitable. After a detailed evaluation of multiple solar thermal technologies and keeping in mind the space constraints and integration requirements, Chitale decided to install two of Clique Solar’sARUN solar boilers. Clique Solar is India’s first solar boiler company and a pioneer in solar thermal concentrating systems in India. Two-dish ARUN concentrated solar thermal (CST)system generates steam which is used for pasteurization, can washing, cleaning in place (CIP) and crate washing. 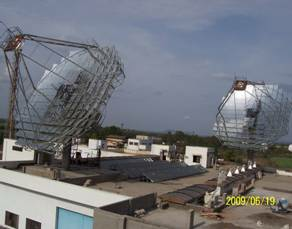 Both these ARUN solar boilers dishes are installed on the terrace of its 3-storey building. The footprint area is less than 3m x 3m per dish. The civil engineering and integration challenges were innovatively handled. 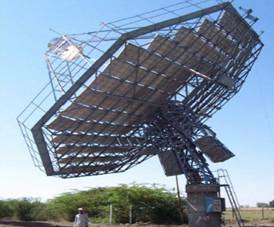 The ARUN dish tracks the sun on two axes. Water circulates through the receiver coil which is placed at the focal point of the dish transferring the thermal energy from the sun to the circulating water and converting it to pressurized steam at 152°C at 5 bar. Solar Steam Generation system has been integrated such that the ‘steam separator’ acts as both a steam accumulator and buffer water storage. At the start of the day, circulating pump pumps water from the steam separator vessel & circulates it through the receiver coils. The water is then converted to water and steam mixture. Thus both the temperature and pressure of the fluid in the separator begin to rise after continuous circulation. The steam delivery starts from the top of steam separator as soon as the required steam delivery pressure (5 bar, 152°C) is achieved. The steam delivered by the system is collected at the common header of Chitale’s systems for milk processing & other application. Chitale Dairy has set an example by pioneering the successful use of solar technology for satisfying its thermal energy needs in various applications like pasteurization, can washing, crate washing and CIP. Not only has the system been operating successfully, but the economics of the investment also makes a strong case for any industry with such high thermal energy requirement to install such systems. The MNRE subsidy coupled with accelerated depreciation makes this an extremely attractive alternative to the rising fuel costs and growing environmental concerns.